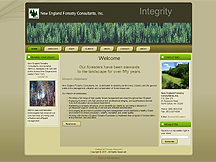 New England Foresty Consultant's (NEFCo.) redesigned website goes LIVE. NEFCo. 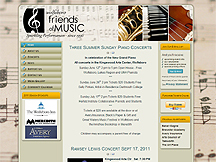 is pleased to announce the launch of their newly redesigned website at www.cforesters.com PCS Web Design worked closely with Kristin Brooks at NEFCo. to deliver a website design that would accurately represent the quality and commitment to forestry stewardship that is NEFCo. 's hallmark. Simplified navigation, an entirely updated appearance, and the retention of desirable existing elements was the focus of this project. We're pleased with the results and have had positive feedback from site visitors thus far. The Large Print Book Company, a 38-year old family run business, sought the services of PCS Web Design to create a fresh new look for their online presence. 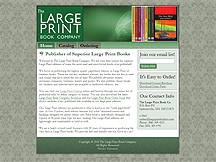 Their previous website was out-of-date and didn't accurately portray their reputation for providing the highest quality books in large print. PCS Web Design was able to deliver a site more in keeping with the customer's design goals and within their limited budget. PCS Web Design helped to directly target their niche market by making the website as easy-to-read as their large print books by specifying larger-than-normal fonts in the CSS of the website design! New England Forestry Consultants, Inc. (NEFCo) manages over 400,000 acres across New England and eastern New York. Their website was becoming outdated and needed an overhaul. PCS Web Design will be delivering an updated and streamlined architecture that will allow NEFCo. 's website to grow with the company. The new design will retain some of their existing site's branding while improving the ease-of-use and access for their customers. Watch for our announcement when their new website goes live! The Problem: The Wright Museum had outgrown its previous website's capabilities. Since the Museum's website had grown over many years on a static, HTML-only infrastructure, the addition of new content and ongoing maintenance was becoming too time-consuming and difficult. The Solution: Jim Fontaine, the owner of PCS Web Design, met with Mark Foynes, the Executive Director of the Wright Museum, to discuss the immediate needs and long term requirements that the Museum's new website would need to meet. After assessing the Museum's needs, PCS Web Design created an entirely new website based on a CMS-enabled architecture and migrated the Museum's extensive collection of existing content as well as added entirely new content. New capabilities include: an excellent calendar/scheduling module to keep the Museum's membership and the public informed of the many lectures, special exhibits, and events that the Museum holds; the ability for the 501(c)-3 to accept donations online; and, an integrated gallery to share many of the Museum's photographs of its extensive collection of WWII artifacts and memorabilia - some of which are the only ones of their kind. The end result: The Wright Museum's new website allows them to add valuable new content regularly and manage all of their content quickly and efficiently, thereby reaching a wider audience interested in supporting the Museum's important work. 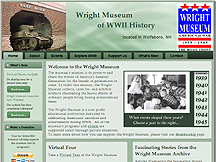 PCS Web Design's owner, Jim Fontaine, had this to say, "When the Wright Museum approached me to discuss their needs, I was immediately excited by the prospect of being able to play such an important role in helping to meet the goals of the Wright Museum and its mission. Having had a grandfather who received a Purple Heart during the Invasion of Normandy (D-Day operations), and taking into consideration the current conflicts America is currently involved in, the importance of reminding all Americans of the sacrifices made by so many during WWII is as relevant today, if not more so, than ever before."